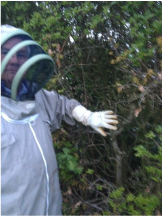 We started bee-keeping in 2007 as a fascinating hobby which soon began to grow as we became more involved. We now have 18 hives of bees. We live in St Albans and all our honey is produced, extracted and bottled into jars in St Albans. All of this is done by hand without filtering out pollen from the honey and without heating the honey. Because we do not produce on a large scale, we apologise if our honey runs out - please look forward to when the new honey is available again!